At the core of what makes a home green is how efficiently it responds to its environment. The key to building a home that provides maximum indoor comfort, temperature balance and energy efficiency is understanding your sustainable design options and purchasing the right HVAC system. A very useful tool is LEED (The Leadership in Energy and Environmental Design) for Homes, which is a rating system that promotes the design and construction of high-performance green homes. A green home uses less energy, water and natural resources; creates less waste; and is healthier and more comfortable for everyone living in it. LEED-H has established guidelines to help homeowners get the most out of their heating and cooling, while using as little energy as possible. Here are some helpful guidelines to get you started so you can create the perfect home environment using proper orientation, insulation, sealer, windows and the right heating, ventilation and air conditioning system (HVAC), no matter the season, climate, location or size of your home. You'll want to take advantage of your site, by positioning your home so that the rooms, doors and windows can maximize natural resources like solar heat and wind patterns. This is what architects and designers call a Passive Design, because it allows your home to absorb and/or reflect heat and cool air without the use of HVAC systems. This design method is obviously the best way to start building a green home because it relies only on natural resources, which greatly reduces your energy bills, improves the air quality inside your home and protects the environment. Talk to your designer/architect and builder to make sure that the orientation of your home will lend itself to a sustainable home. If you live in a colder climate, turn the broadest side of your home toward the sun. If you live in a warmer climate turn the broadest away from the sun. The same rules apply for the placement of windows and doors. Surround your home with trees because the shade keeps the majority of your house protected from unwanted heat. If you don't have trees, consider porches, deep overhangs and pergolas. They won't protect your roof from the sun, but they will help shield your walls and create a cooler microclimate around your home. While insulation may not be the 'hot' product to purchase for your new home — it is one of the most important products when it comes to building a green home. There is a lot to be gained in comfort and savings, by spending a little bit of time researching insulation. Choosing the right insulation material for your home depends on where it will be used and the building and energy codes for your particular town. Your contractor can help you choose the best options for your needs. Insulation works by slowing the flow of heat trying to leave your home by making it jump across million of tiny air spaces. The smaller and more plentiful the air spaces, the better the insulation. Your home easily loses heat to the outside air through radiation and conduction, which moves the heat from a warm area to colder area - basically from your heated house to the outdoors. Insulation is rated by its R-value, which is the insulation material's resistance to heat flow. The higher the R-value, the more effective the insulation. To compare the effectiveness of various types of insulation you'll want to look at the R-value per inch of insulation. There are four basic types of insulation: loose fill, batts and blankets, rigid board and spray foam. The challenge of making your home air tight is that air and water can pass through the smallest cracks, so you'll need to pay special attention to areas around your light fixtures (particularly recessed lighting), electrical outlets, attic openings, and gaps around your windows and doors. Make sure your builder wraps the frame of your home with an air/moisture barrier such as Tyvek. When it comes to choosing your windows, you need to look beyond the aesthetics and focus on the glass itself, because it's the glass that will block the heat in the summer, cold in the winter and allow for an abundance of natural light. When you're purchasing windows, be sure to take note of the U-value, which is a measure of how much heat makes it through an assembly (as opposed to an R-value, which is a measure of resistance.) 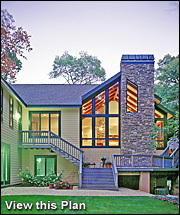 The lower the U-value of your windows, the more insulation they provide. Thanks to the push for green building, insulated glass (two panes of glass sandwich an airspace, which serves as an insulator) and Low E window glass (treated with a layer of invisible, microscopic silver coating to provide greater energy efficiency and increased comfort) are becoming more common in new construction. Since most of us don't live in a climate where we can utilize a passive solar design, we need to purchase heating and cooling equipment. High efficiency begins with choosing ENERGY STAR® qualified equipment. A great placed to start to build your dream green home is researching the EPA's ENERGY STAR® project — they have great tips on energy efficiency, particularly when building a new home. Most importantly, make sure everything works together! How Green Are Your Options?